Scrum itself is a simple framework for effective team collaboration on complex products. 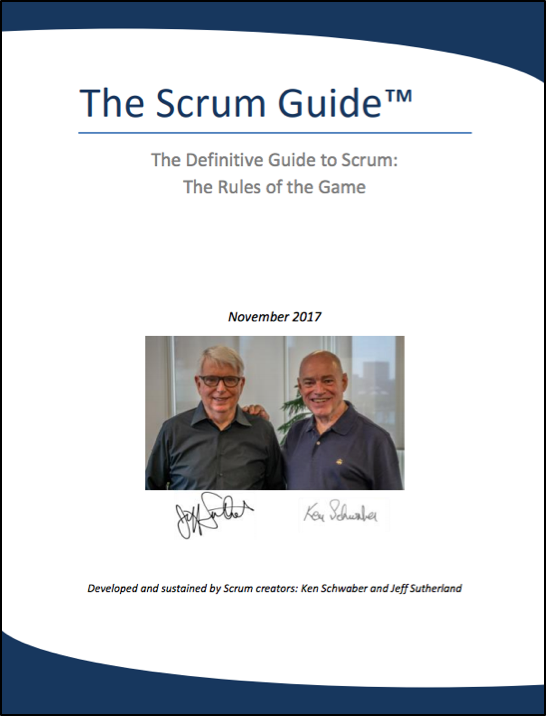 Scrum co-creators Ken Schwaber and Jeff Sutherland have written The Scrum Guide to explain Scrum clearly and succinctly. This Guide contains the definition of Scrum. This definition consists of Scrum’s roles, events, artifacts, and the rules that bind them together. The Scrum Glossary is meant to represent an overview of Scrum-related terms. Some of the mentioned terms are not mandatory in Scrum, but have been added because they are commonly used in Scrum. To learn more about the Scrum framework, to identify which of these terms are required elements of Scrum and to understand how the mentioned elements are connected, we highly recommend that you reference The Scrum Guide. To learn more about terms specific to software development teams using Scrum and agile software development techniques, reference the Professional Scrum Developer glossary. Scrum is simple. It is the opposite of a big collection of interwoven mandatory components. Scrum is not a methodology. Scrum implements the scientific method of empiricism. Scrum replaces a programmed algorithmic approach with a heuristic one, with respect for people and self-organization to deal with unpredictability and solving complex problems. The below graphic represents Scrum in Action as described by Ken Schwaber and Jeff Sutherland in their book Software in 30 Days taking us from planning through software delivery. This short video provides a simple overview of Scrum, allowing viewers to learn about the roles, artifacts and events and how they come together to deliver a product to market. This video highlights the latest version of The Scrum Guide with Ken Schwaber and Jeff Sutherland walking through the latest updates and tackle several myths that exist today. They provide insights into why they created Scrum, how they have used it through the years and where Scrum is going. Although always considered to be a part of Scrum and often written about, in July 2016, the Scrum Values were added to The Scrum Guide. These values include Courage, Focus, Commitment, Respect, and Openness. 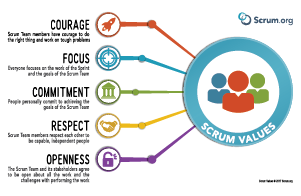 Read the Scrum Guide to learn more about these values, how they apply to Scrum and download this poster. Where Does Your Current Role Fit? Watch this webinar on The Truth About Job Titles in Scrum to learn more about how roles have evolved and where you may fit. Scrum defines three roles, the Product Owner, Scrum Master and Development Team Member. But what happens if you have a different job title? It doesn’t mean that you are out of luck or out of a job, in most cases it means the exact opposite with your job expanding to deliver more value in the Scrum Team. So, where do you fit in Scrum? In this webinar, Dave West, CEO and Product Owner of Scrum.org talks about the roles of Scrum and how the three roles relate to your existing job titles. He describes the future of work in the context of an agile delivery model and what the implications are to job descriptions and career progression. There are over 100 books about Scrum on the market today, tens of thousands of papers, articles and presentations, but it all starts with The Scrum Guide. The Scrum Guide was written and is maintained by the creators of Scrum, Ken Schwaber and Jeff Sutherland and is considered as the Body of Knowledge for Scrum. With over 200,000 members of our Scrum community, you can ask a question to the Forum and expect responses that will immediately help you. Our community of Professional Scrum Trainers (PSTs) are experts in their field and are always writing Blogs which provide insights from their experiences working directly on Scrum Teams. Articles, white papers, videos, webinars and other materials are often published by the community and available in the Resources section of the website and read other ways to learn about Scrum.